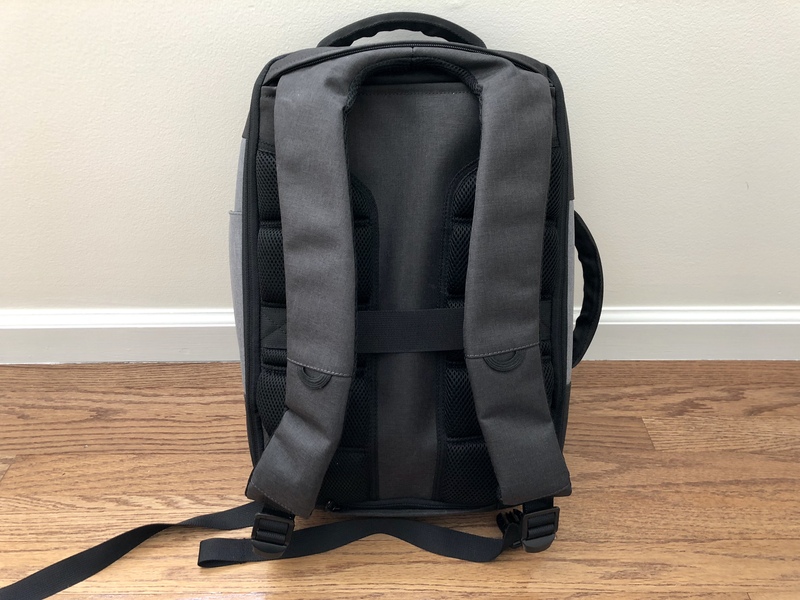 Note: This backpack was provided to us for review by Standard Luggage Co.
Standard Luggage Co. is one of many new Luggage companies that have roots in Kickstarter. Standard is based in Canada and launched in 2015. The Daily Backpack is an 18L convertible bag that is advertised for work and travel. It can be used as a briefcase (side handle), backpack, or messenger bag (with the included strap). The bag is divided into two compartments. The main compartment opens from a zipper on the back, and there is a much smaller compartment on the front. Additionally, there is a collapsible water bottle pocket, a small zippered slash pocket on the front, and a zippered RFID-blocking pocket on the top. The RFID-blocking pocket is neat, but my passport wallet wouldn’t fit. Keep that in mind if you typically carry more than a passport on its own or a small wallet. The bottom of the back also has a small zippered compartment. 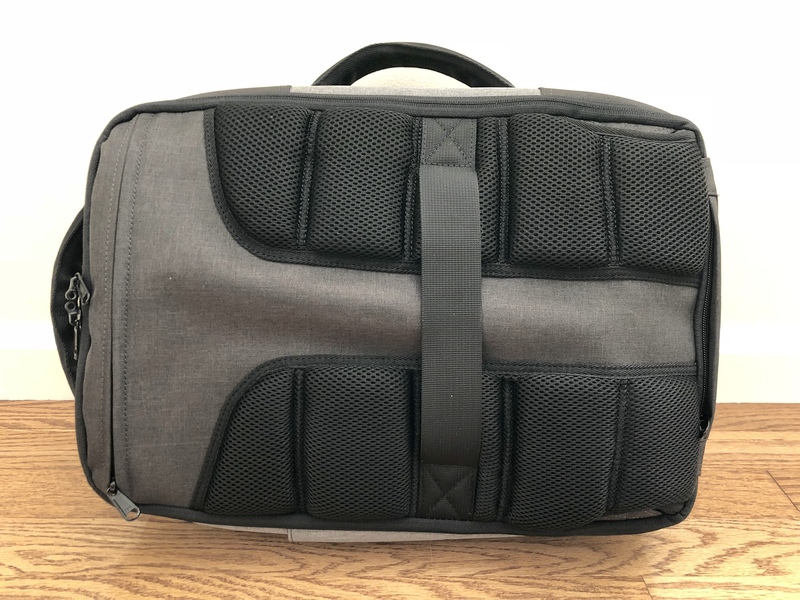 The main compartment has two sleeves on the inside of the back lid (the outside contains a pocket for the backpack straps). These comfortably fit a 15” laptop and an iPad or Kindle. 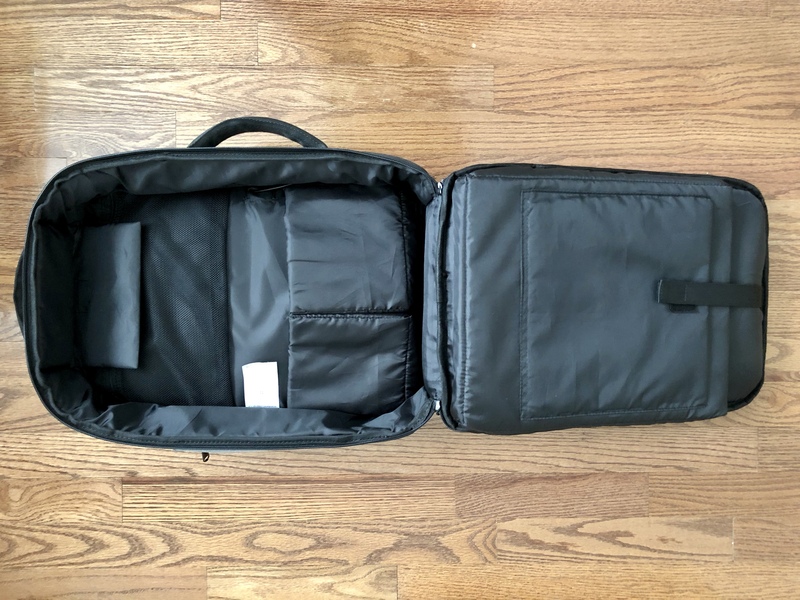 The inside of the main compartment has two pockets at the bottom, about 1/3 the height of the bag, and a mesh zipper pocket. The small pockets are padded and designed for camera lenses; I did not find them useful. The front compartment has one full width pocket with two half width pockets and two pen loops on the front. The lid has two zippered mesh pockets. You will also find a USB cable in here to connect a battery to the external USB port on the side of the bag. While this is a neat idea and works, I wonder how practical and durable it is. I can see myself snapping a cable off in the external USB port. The fabric used on the outside of this bag looks nice and seems durable. However, the zippers could use some work. I found them to be stiff and they didn’t seem beefy enough for the bag (especially on the main compartment). The backpack straps were comfortable enough for the amount you can load into this bag. I did find the combination of the padding on the straps and the padding on the back of the bag to make for a bit of a lumpy back. Overall, the bag is very padded, giving the bag a rigid structure. Even if it’s not full, it will still have the same exterior dimensions. I imagine this helps with the transition from backpack to messenger bag to a briefcase, but it is not something I typically like in a bag. If you end up loading this with electronics, especially camera gear, this would be a positive feature. I did not find this bag useful as a general purpose travel briefcase, but I could imagine a few scenarios where this might be an attractive bag. For a photographer, this bag might do a nice job to carry gear for a small shoot. The overall padded nature of the bag would probably protect camera equipment reasonably well. 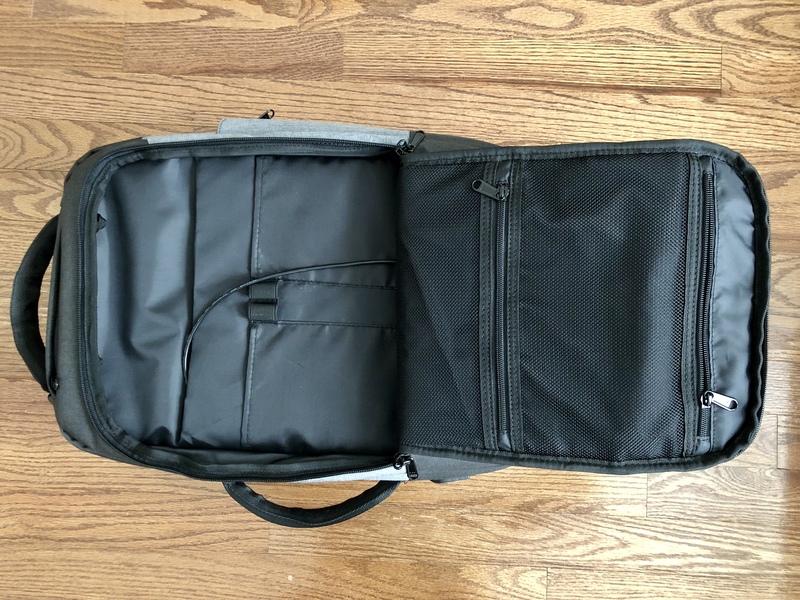 You would need an insert for the main compartment to hold your camera body, but the two lens pockets and the other pockets of the bag would do a good job holding a large portion of your gear and accessories. The included rain fly is also a nice bonus if the weather is going to be poor. This bag could also serve you well as a briefcase or work bag if you typically carry a full bag. The structure of the bag makes it more suited to carrying full. When packed only partially full, the bag can feel unbalanced. The structure keeps heavier items from compressing the bag which can throw off the balance. While this bag looks nice, it is not my favorite bag to carry. The structure makes it hold less than it appears, and I found the back access panel for the main compartment to be awkward to open and use. The backpack straps are nice enough, but I mainly carried it as a messenger bag/briefcase. Due to the shape and structure, I think it is best suited as a briefcase. 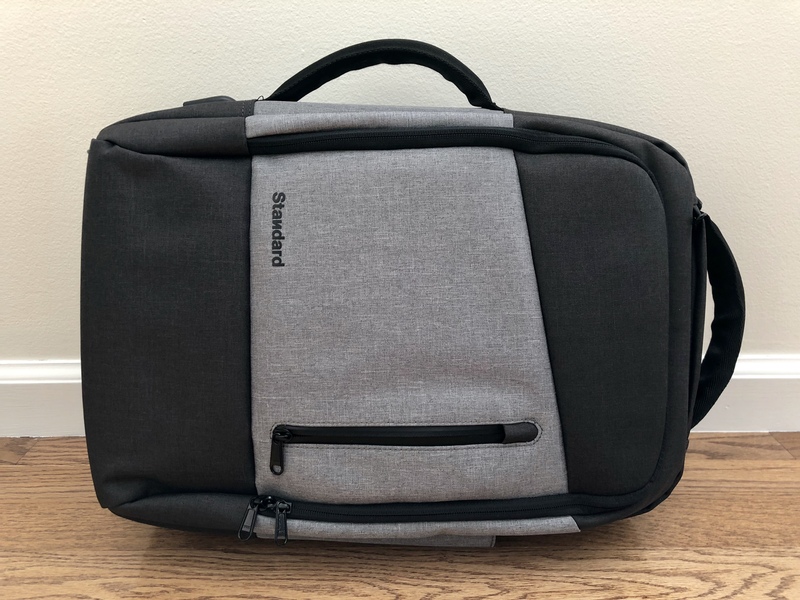 For the price, I think it could make a pretty good camera/tech bag, but I think there are better options out there for a simple briefcase or everyday work backpack.